Get ready for the Big 3 Come Together weekend, three consecutive nights of fun at Subline in Brighton. It kicks off on Friday 10 February with the Big Scrum sports kit night (10:00pm-4:00am), continues on Saturday night with Leathermen South (10:00pm-4:00am), and climaxes on the afternoon of Sunday 12 February with our Brighton Bear Black Valentine party (3:00-7:00pm). For full details of the events, visit the Subline website. You can also check out these Gscene articles about the Big 3 Come Together weekend and the Brighton Bear Black Valentine party. 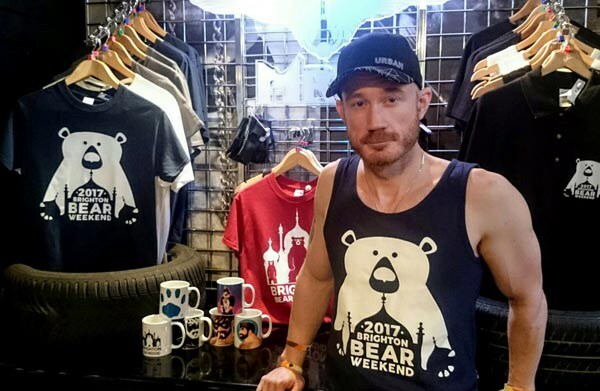 Very limited numbers of red t-shirts and navy blue vests featuring the Brighton Bear Weekend 2017 logo are now on sale at Prowler Brighton (112-113 St. James’s Street). Once they sell out, no more will be produced, so head down there if you want to get your hands on an exclusive item! Look out for the logo on our range of t-shirts and other items, coming soon!